Steep the tea leaves in ½ cup hot water for 5 minutes. You’ll want a fairly strong steep since the flavors will get somewhat muted with addition of the cream and by serving chilled. Once tea has steeped, strain the liquid through a fine sieve into a medium bowl and while the tea is still hot, add the bloomed gelatin, stirring until fully dissolved. Whisk in the condensed milk, dulce de leche, tamarind paste, and salt until all the ingredients are fully incorporated. Chill this bowl by placing it in a larger bowl filled with ice water. Whisk every 5 minutes or so (for about 20-30 minutes) until the gelatin just starts to become rather thick. Don't allow the mixture to set fully, but allow it to get thick enough to be able to fold in the whipped cream from the next step below and still have it hold its shape a bit. While the base is setting, lightly oil 4 (2-ounce) silicone molds or, if not using molds, set out 4 ramekins or jelly jars. In a mixer, using the whisk attachment, whip the heavy cream and sour cream until it holds medium-soft peaks. If the whipped cream is ready before the parfait base has set, put it in the fridge until ready to use. Once the ideal consistency of the parfait base is achieved, use a spatula to fold in the whipped cream until completely smooth and no white streaks remain. Pour into the prepared molds (or jars), and carefully tap on the countertop a few times to remove excess air bubbles. Freeze for at least 3 hours, or overnight. Pop the frozen parfait base out of their molds (if using, or skip this step if using jars). Thaw before serving, either overnight in the fridge or for 3 hours at room temperature. 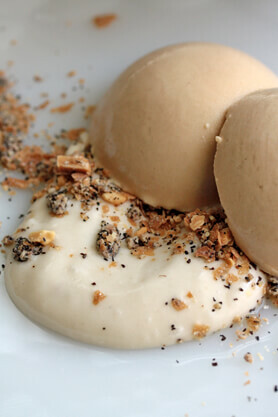 To serve, dollop and sprinkle alternating layers the coconut curd and almond crisp over the parfait base. Cut the top off the coconut and drain the water into a blender. Use a spoon to scoop all of the white coconut meat from the inside and add this to the blender. Blend on high speed until homogenous. Add ¾ cup of this fresh coconut cream to a small saucepan along with the sugar and vanilla bean. Reserve the remainder of the coconut cream for another use. Set the blender canister aside, without washing, as you’ll need it again in the final steps below. Turn heat to medium, and cook, stirring occasionally until sugar is melted and steam starts to rise off the surface, as it comes to a simmer. In a separate bowl, mix together the whole eggs and egg whites. Add a bit of the warm coconut cream mixture to the eggs and stir to temper. Keep adding more coconut cream to the eggs, a bit at a time, stirring all the while, until all of it is fully incorporated. Return the mixture to the saucepan and continue cooking until it thickens and registers 180°F, approximately 12 minutes. Once the coconut cream mixture has thickened, remove the vanilla bean pod and pour it into the canister of a blender. Blend on high tossing in the butter one tablespoon at a time. Once all of the butter is incorporated, add the bloomed gelatin. Blend a few seconds more until it dissolves. Pour the coconut curd into a jar and let cool in fridge for several hours (or overnight) to allow it to thicken before using. Spread the almonds evenly in a pie plate (or similar oven-safe dish) and toast in the oven for 15 minutes. Cool to room temperature. Roughly chop the nuts and combine with the almond butter, feuilletine, confectioners' sugar, salt, organic Thai black tea leaves, citric acid, and salt in the bowl of a stand mixer fitted with the paddle attachment. Mix on medium-low speed for about 1 minute, until evenly distributed. Store in an airtight container at room temperature for 5 days or in the fridge for up to 2 weeks.